On arrival at Tribhuvan International Airport you will be received by our office executive who will assist you to board your vehicle to Kathmandu City. Proceed towards check-in at hotel. In the afternoon you will be taken for sightseeing of Kathmandu City. Overnight stay at hotel in Kathmandu. Kathmandu: is the capital and also the largest metropolitan city of Nepal. The city is the urban core of the Kathmandu Valley in the Himalayas, which also contains two sister cities namely Patan or Lalitpur, 5 kilometers to its southeast and Bhaktapur, 14 kilometers to its east. It is also acronymed as KTM. The cityís rich history is nearly 2000 years old, as inferred from an inscription in the valley. Its religious affiliations are dominantly Hindu followed by Buddhism. People of other religious beliefs also live in Kathmandu giving it a cosmopolitan culture. After breakfast at hotel proceed for half day sightseeing of the city. This includes visit to Pashupatinath and Boudhanath. Rest of the evening is free for individual activities. Overnight stay at Kathmandu. Pashupatinath: The Pashupatinath Temple is a famous 5th century Hindu temple dedicated to Lord Shiva (Pashupati). Located on the banks of the Bagmati River in the eastern part of Kathmandu. This is the place where holy saddhus pray and cremations on the Bagmati River are carried out. Boudhanath: is one of the holiest Buddhist sites in Nepal and it is one of the most popular tourist sites in the Kathmandu area. With its large stupa, this is the place where all devout Buddhists come for a pilgrimage. After breakfast at hotel proceed for half day city tour of Kathmandu. This includes visit to Patan city and Swayambhunath. Rest of the evening is free for individual activities. Overnight stay at Kathmandu. 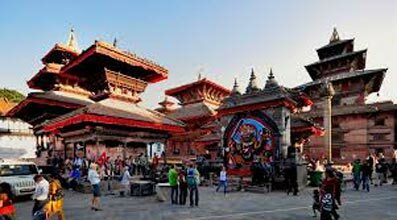 Patan City: Also known as Lalitpur, the city of beauty is separated from Kathmandu only by the Bagmati River and is the second largest town in the valley. Patan is renowned as a very artistic city. Most of the Nepalese art of any form is devoted to Gods, and there are an abundance of temples and vihara in the city. Patans central Durbar Square is absolutely packed with temples: Itís an architectural center point with a far greater concentration of temples per sq. meter than in Kathmandu or Bhaktapur. Within the city also lies the Tibetan refugee center, home to most of the valleys Tibetan population. While technically refugees, the Tibetans are some of the wealthiest people in the valley because of the carpet industry they operate. For those looking to bring home a fine Tibetan carpet, this is the place to shop. Swayambhunath: Swayambhu, also known as the Monkey Temple as there are holy monkeys living in parts of the temple in the north-west, is among the oldest religious sites in Nepal. Although the site is considered Buddhist, the place is revered by both Buddhists and Hindus. The golden spire of the 5th-century Swayambhu stupa is adorned with a colorful fluttering of prayer flags; it crowns a hill overlooking the Kathmandu Valley and offers fantastic views over the city of Kathmandu. Swayambhunath is one of the most recognizable symbols in Nepal and the painted eyes of Buddha watch all who ascend the worn stone steps. You are free till you flight departure time. Transfer to Tribhuvan International Airport to board flight for onward journey.